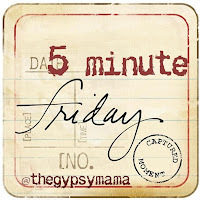 For the first time in a very long time, I’m joining with Lisa-Jo at The Gypsy Mama for her 5-Minute Friday link-up. Five minutes for free-writing – no editing, no over-thinking, no re-do’s. JUST WRITE. A recent opportunity came knocking in the form of a week on St. Thomas with our son and his family. Glad we heard that one! They say it only knocks once – but I remain unconvinced. Seems to me, it comes ’round the door on a regular basis. Question is: Do we hear it? Sometimes I’ve been paying attention and I grab onto it for all I’m worth. Or the time that same brown-eyed guy said, “Hey, I’m heading to Africa for two years. Wanna come along?” Oh, yeah, that one was definitely not to be missed. And then there were those three surprises – well 2 out of 3, anyway. Each of them the most golden of all the opportunity-knocking I had yet encountered. Not.to.be.missed. And now, even now, I hear that tapping from time to time. Opportunity keeps showing up. You must have an amazing life story… you should write your bio! Oh yes! Opportunity comes around so many times, but we have to choose to embrace it. I feel that way too Diana, the oppotunities abound and we can choose. So glad you got to go on that awesome getaway, the gifts of God are just beyond comprehension aren’t they? And you inspire by the way you say yes. You made the best choice! Opportunity is knocking, ringing the bell, peering in the windows, and I’m hiding in the bathroom, waiting for it to please, please, please give up and go away. It’s calling you to come out and play, Meg. Do it. I think you’re right, Connie. Hope I can keep making good choices until they put me in the ground. Thanks, Shelly. And I’m grateful for our vacation getaway, too. It was a beautiful week. Thanks for stopping by, Erin. Choosing is up to us, isn’t it? I’ve had a good, rich life. And I keep saying I’m going to write it – so maybe I’d better get busy with that! I love this Diana. There are always new adventures – no matter our age or season in life. I am excited to thing of the possibilities. We just have to be looking, listening and willing. Thank you, Linda. We do have to keep listening, looking and answering. You lovely brave opportunity girl … I want to pay better attention. I have said yes to mentoring young women in my new city … but wonder if I am missing other opportunities. Time to tweek my listening skills. Love the family vacation picture. This is the sweetest and most intriguing response. Hey Glenda – thanks for stopping by! Always glad to see you around here. Sometimes the opportunity is to be still, to rest and wait. So don’t jump into anything too fast, either. You’ll know. Fantastic post on opportunity! So glad I’ve found you.